For only $29 these earbuds are a steal. 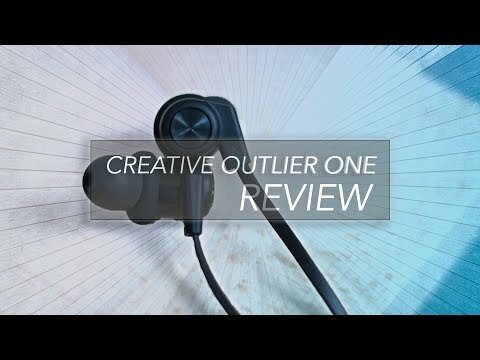 Though they have their faults, the Creative Outlier ONE earbuds are a solid choice for anyone looking for a good pair of Bluetooth earbuds to bring with them to the gym but don't want to break the bank. Updated on September 21, 2018, to include frequency response chart and battery data. If you’re headed to the gym chances are, you’re reaching for a pair of Bluetooth ‘buds. There are still a few brave, resistant souls I see walking around the gym with wired headphones but more often than not, it’s a Bluetooth pair that I see. And although we have our qualms with Bluetooth, it’s hard not to recommend them for exercise. Not having to deal with wires is super convenient and Bluetooth earbuds have gotten way cheaper and way better than years past. Case in point: the new Creative Outlier One earbuds. Are they going to be your favorite new pair of headphones? Probably not. But at $29 you should probably get them anyway because spoiler alert: they’re that good. Everything that comes in the box of the Creative Outlier One earbuds. In the box, you’ll get the headphones, a soft carrying case, micro USB charging, a cable clip, two extra sets of ear tips, and a silicone pair of earbud wings. Then you’ll get the usual amount of paperwork of course. How is the Creative Outlier One built? The Creative Outlier One earbud housings appear large but fit well. Close your eyes, and picture a pair of Bluetooth earbuds. That’s what the Outlier One headphones look like. And there’s nothing wrong with that as two earbuds connected by a wire are a tried and true design, just don’t expect to be wowed by their beauty. To that end though the team at Creative did make some quality choices when it came to build and design. These are IPX4 certified making them entirely sweatproof which is obviously a necessity for workout ‘buds, but they also added some clever design tweaks to take these from good to great. The flat cable keeps the Creative Outlier One earbuds from getting tangled. For one, they borrow the same angled earbud design from the previous (but more expensive) Outlier earbuds which angle sound directly into your ear. They also have a nice flat cable which keeps them getting annoyingly tangled when you stuff them in your pockets or gym bag. Sticking with the earbuds, I also found these to be extremely comfortable. At first glance, they seemed large and I was envisioning having to stuff them in my ears uncomfortably, but I didn’t have to. They fit snugly, sure, but it wasn’t painful at all and I was able to use them for hours without pain. This is probably because of the rubber cushion they have on them, which can be replaced for a similar one with ear wings if you’re having trouble keeping them in your ear. Which brings me to the only thing I’m not crazy about when it comes to the build of these headphones, and the control module. It’s understandable because of the battery life, which we’ll get to later, but that doesn’t make it any less pretty. It’s a large chunk of plastic dangling on the cable with cheap feeling buttons, but on the bright side, I didn’t have any problems with it pulling the earbuds out. Even though it’s big it’s also surprisingly lightweight, so running with them was no problem at all. When it comes to exercise fit is extremely important to me, but a solid connection is even more important. Skipping music and dropouts aren’t that big of a deal to me in everyday life, but when I’m exercising each one causes a stab of annoyance. Luckily, I had no problem with the Outlier One earbuds while using them. Skips were non-existent as long as I was within 10-15 meet of my source device which I always am at the gym. Things do get a little jumpy once you past the 25-foot mark but, again, if you’re going to be exercising you’ll rarely be that far away. But it is something to take note of if that’s an issue for you. An IPX4 build makes the Creative Outlier One perfect for exercise. Another thing that might bother you is call quality. Even though calls sounded fine on my end, I got plenty of complaints from others that I sounded “far and echo-y”. It’s good enough to answer a quick phone call while exercising but you probably won’t want to have a full blown conversation with these. When I switched back to my phone the person on the end literally said, “Wow, that’s much better.” On to another good feature though, controls are also all that you could want from a pair of workout headphones. You can switch between tracks, pause music, answer and end phone calls, and control volume with just a few different sets of clicks. Thanks to the humorously large control module the buttons are pretty big, meaning that even though they’re not as raised or as tactile as I would like it’s hard to accidentally click the wrong one. The Creative Outlier One control module is bulky but boasts a 9.4-hour battery life. Now for the reason the control module is so large: battery life. Creative claims these will last you about 9.5 hours and in our testing, we got 9.4 hours of playback with a constant output of 75dB(SPL). One bad thing is that these do charge via micro USB and in a future where everything should be USB Type-C it’s a little annoying. But hey, that future isn’t here yet and these aren’t that expensive anyway so we’ll give Creative a pass for that. Angled nozzles help the Creative Outlier One earbuds fit comfortably for extended periods of wear. One area of these headphones that I was pretty surprised with was sound quality. For a pair of Bluetooth ‘buds these do a great job with sound isolation which I think is in no small way thanks to the second pair of rubber sleeves that can go on the earbud. The bass I think is perfect for a pair earbuds you’re going to be using while exercising. I say while exercising because for casual listening these are definitely too much for me. The Creative Outlier One earbuds reproduce emphasized low-end, which subsequently results in occasionally masked mids and highs. The bass a little all over the place and definitely given the most attention, but they’re not absurdly bass-heavy like some other headphones out there. The bassline in Campo by Toro y Moi was extra groovy and easy to follow, which is great since that’s the song that I usually start my runs with. These got me nice and pumped thanks because it gave that groovy bassline just a little bit extra, but the same can’t be said for the mids and highs. With everything going on in the song Goosebumpz by Mac Miller his vocals tended to get lost in some of the instrumentation and they also sounded a kind of hollow. Highs were a mixed bag for me. The quick “tsk, tsk” and throughout the song Special Affair by The Internet was fine, but the rhythmic hi-hats in the chorus were a little too forward. At max volume, they toe the line of harshness and at times seem to be even louder than the vocals which is definitely not how they’re supposed to sound. Should you buy the Creative Outlier One? All that said, these don’t sound bad at all considering the price. Do they sound amazing? Probably not. But that’s fine because you’re not paying audiophile money to begin with. For headphones, you can just throw in your bag and take to the gym. These check all the boxes. Sweat protection? Check. Long battery life? Check. Comfortable? Check. The fact that these sound good as well is just an added bonus, so we’ll take what we’re given here. WIRELESS BLUETOOTH, HIGH DEFINITION AUDIO | High definition Bluetooth 4.1 consumes low power with minimal latency. Reach new heights in your fitness with the specially tuned 6mm Neodymium drivers that keep your music pumping. UP TO 9.5 HOURS BATTERY LIFE | Long-lasting battery life with a short charge time of 2 to 3 hours. Charge up via the microUSB port located on the inline remote control – you can even use your portable power bank to charge it up!